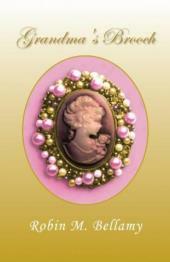 "Grandma's Brooch" is a heart-warming fiction short story loosely based on the life of Bellamy's great-grandmother. The story is about Grandma Hannah and one of her most precious family heirlooms. The story is told by her great-granddaughter who has always admired her since she was a child, but truly begins to embrace their relationship as an adult. The significance of family is also realized even more when family and friends begin to express how important Grandma Hannah's life is to them.